Every week I receive emails from cousins near and far. Many have family stories or photos to share with me. But an email I received last week, was truly unusual in nature! It came from a gentleman named Gerard Loeve who lives in The Netherlands. Gerard tracked down our family website via search, because he was intrigued by the name on a mailbox! I love this story – how a total stranger from another country connect to our family through a photo taken 36 years ago on a trek through the American southwest. Here is Gerard’s email. I’m sure you’ll find his tale totally charming! “My name is Gerard Loeve from Gouda, The Netherlands. In 1980 I traveled the western part of the U.S. with two of my best friends. After our U.S. visit I have been so fortunate to see much more of the globe between 1980 and the present day. Most of my travels were before digital photography and part of the heritage of my travels is a collection of 26,000 slides. A couple of years back I started digitizing (scanning) my nicest and/or most interesting slides (in random travel order). It is a very time consuming process, but the reward is huge. I ‘live’ it all once more and my collection is preserved for ever, also in ‘the cloud’. You must be wondering what all this has to do with you. I will explain. I am presently scanning the slides of my 1980 visit I mentioned above. One of them was taken in Wyoming along a desolate road. My two friends are standing next to the car in the distance. In the forefront of the picture there are a number of typical US mailboxes we don’t see in Europe. After scanning, removing dust & scratches and executing other improvements, I noticed a name on the nearest box: Herman Genetti. For some reason his name intrigued me and I started a search on the internet where I came across your ‘The Genetti Family Genealogy Project’. After some reading and surfing on your very impressive website (my compliments! ), I am almost convinced the mailbox must have belonged to the Herman Angelo Genetti who wrote ‘Herman’s Howling’s’, the book which is mentioned on your website. Since slides do not contain any meta data, I have been doing some more puzzling. The picture was taken in southern direction on October 4, 1980, along road 189, somewhere in the La Barge, Wyoming surroundings, where Herman used to live, as far as I figure. Why I have been doing the search I can not explain. Maybe because my wife’s aunt is also from Southern Tirol (Quero, near Belluno). Her aunt owns a very famous Ice Parlor in The Hague and we have visited Italy very often. We have a ‘thing’ for Italy I suppose. I don’t know. Of course I told my wife about the above and she suggested I should tell you my little story and send you the picture. So here we are. I do not know if my story is of any interest to you, so please do with it what you like. 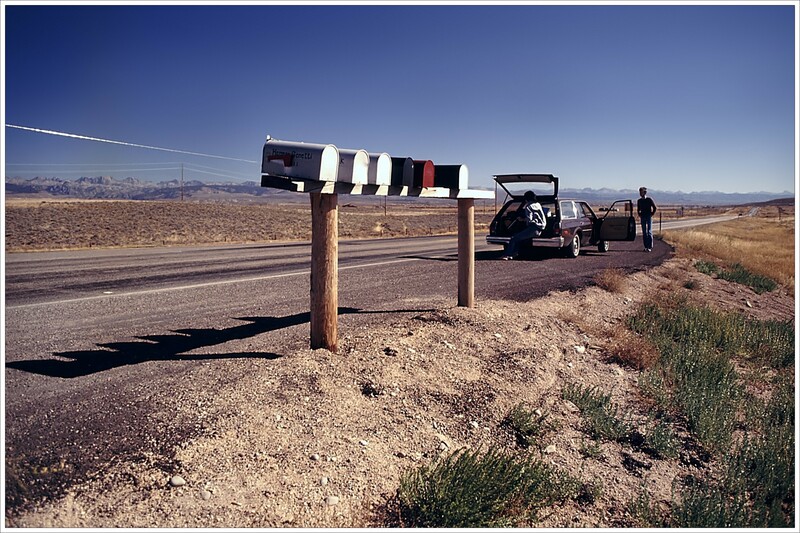 I agree with Gerard – this must have been Herman Genetti’s mailbox located along the side of the road in La Barge, Wyoming! Our thanks to Gerard for sharing this story with us! I hope one day to visit he and his wife in The Netherlands – and we will raise a toast to our ancestor, Herman Genetti! If you haven’t already, check out Herman’s biography “Herman’s Howlings” on our website: click here to read the digital version of his book.